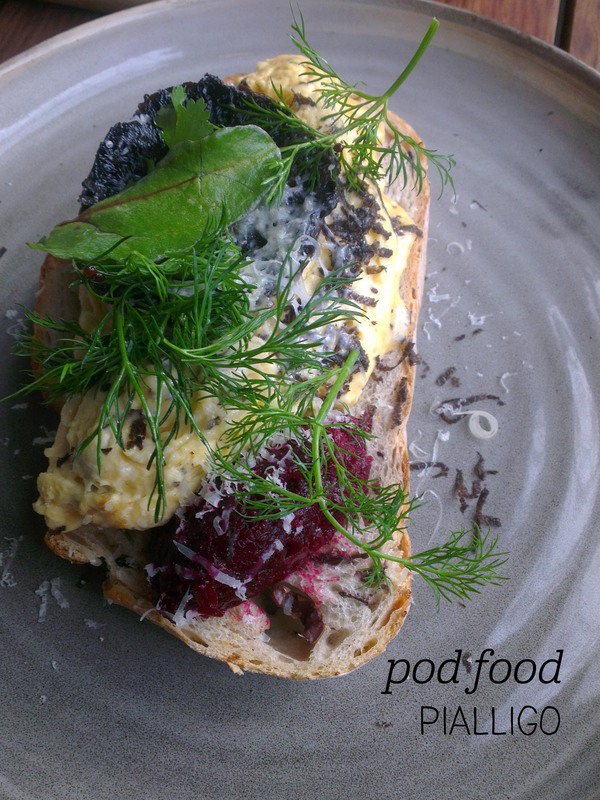 Pod Food is one of those lovely places I keep meaning to spend more time at – I couldn’t believe that this was my first visit this year! A friend and I just scraped in for breakfast (last orders at 10:30), excited to try the truffle-enhanced menu. I started out with a pot of earl grey tea and picked the scrambled eggs with beetroot, gruyere and olive sourdough to eat. Plus truffles. The food took a bit of time to come out, but when it did, the waitress explained that the truffle had been cooked through the scrambled eggs to enhance the earthy flavour. The eggs were light and fluffy, and the rather generous flecks of truffle certainly lifted the entire meal. I loved the minced beetroot’s tartness against the rich egg, and the olive sourdough added a nice hit of salt. I am a huge fan of mushrooms at breakfast, and this one was particularly delicious. We weren’t rushed out as we chatted after finishing our meals, which is always appreciated. Oh, and if you can, ask the waiter about centaurs. I promise, it will make for great conversation to pair with the great food. 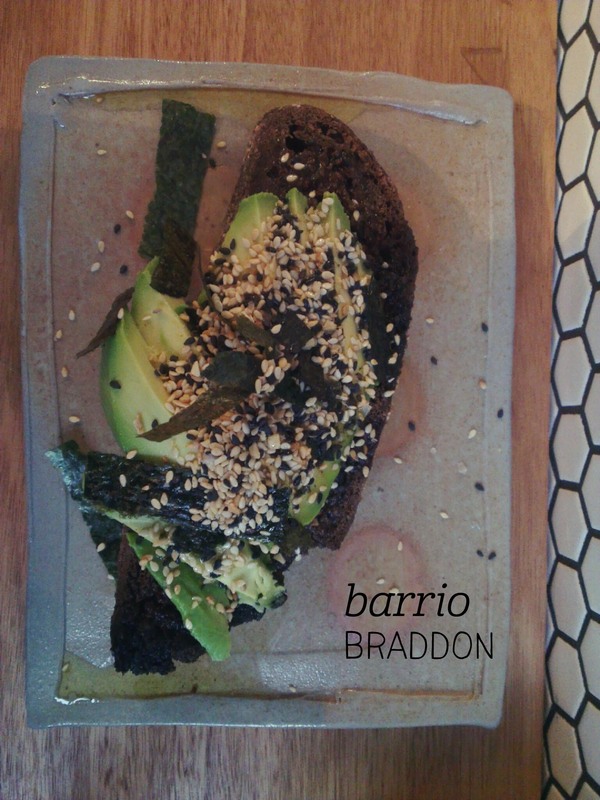 Some places just scream ‘Instagram me!’, and Barrio in Braddon’s Ori building has to be one of them. From the hexagonal tiles to the branded high stools, Barrio is a New York-style tiny cafe that I would love to while away an afternoon in. A friend and I went for breakfast, so I started out with a dairy-free hot cocoa, which came out in a large camping-type mug and was made with nut milk produced in-house. I expected sweet but being cocoa, not hot chocolate, it was definitely not sweet. The nut milk has a dense froth, but it was warming and went well with the food. I had the rye with avocado and togorashi seasoning – it came out on bread you couldn’t cut with the butter knife provided, but oh the flavour! There was plenty of avocado and the seasoning was very generous – lots of sesame and just a hint of spice at the back of the throat. I loved the strips of nori on top too, but what really blew me away was the olive oil. Yep, not your traditional highlight, but the quality and flavour of the oil on that bread was out of this world. Give it a try. 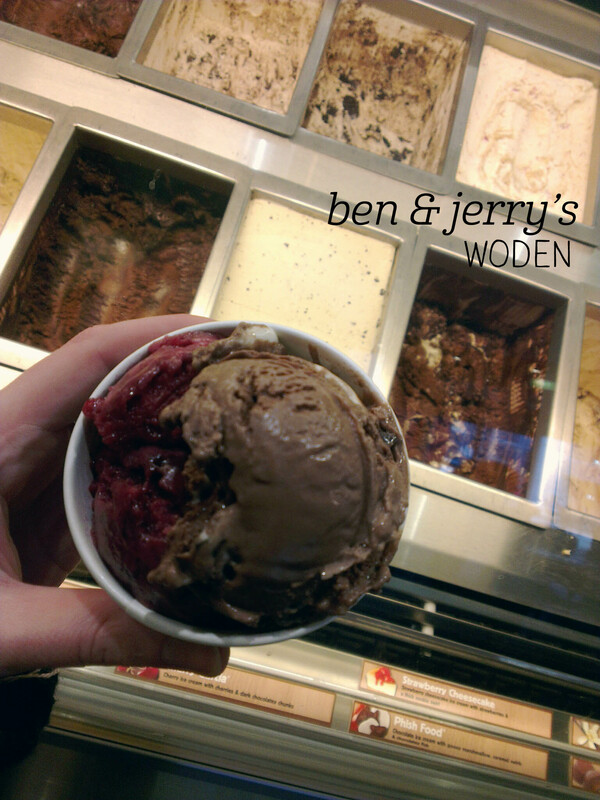 I recently tried Ben & Jerry’s tub-sized icecream and loved it, so was really excited to stop by their Woden ‘Scoop Shop’ to test out some of their other flavours. The store is part of the Hoyts cinema, and has quite a wide range of flavours, including sorbets! I ordered a single scoop in a cup ($5.50), but was allowed to go half-half with flavours. I picked the Berry Berry Extraordinary sorbet (raspberry and blueberry) and a decadent chocolate flavour called Phish Food, which said it had marshmellow and chocolate fish inside. Curious. The sorbet flavour really reminded me of a Boost Juice berry crush, just with a more solid texture. It was really refreshing, but a bit icy and not quite as smooth as I would have expected. The Phish Food flavour was to die for. The chocolate was so lush and creamy, and whilst I couldn’t pick the marshmellow, the bits of chocolate shaped as fish were good quality and tasty. I ended up blending the two flavours (highly recommended) to get a yummy berry-chocolate mix. Great portion size for the price too. Definitely a new favourite. There should be a special category of foodie award for people who get out of bed and manage to successfully leave the house when it’s -6 degrees outside for the sake of food. Just saying. Four brave souls, this one included, met for a 9am breakfast at Patissez on an icy Canberra morning. I started with a soy hot chocolate (probably sits around the middle of the Canberra pack, needed a bit more chocolate flavour) and picked the ‘Porky’ sandwich to eat. I’d heard the portions were big, but I wasn’t prepared for the GIANT BURGER that turned up. The brioche bun was quite crumbly so I ended up eating with cutlery. 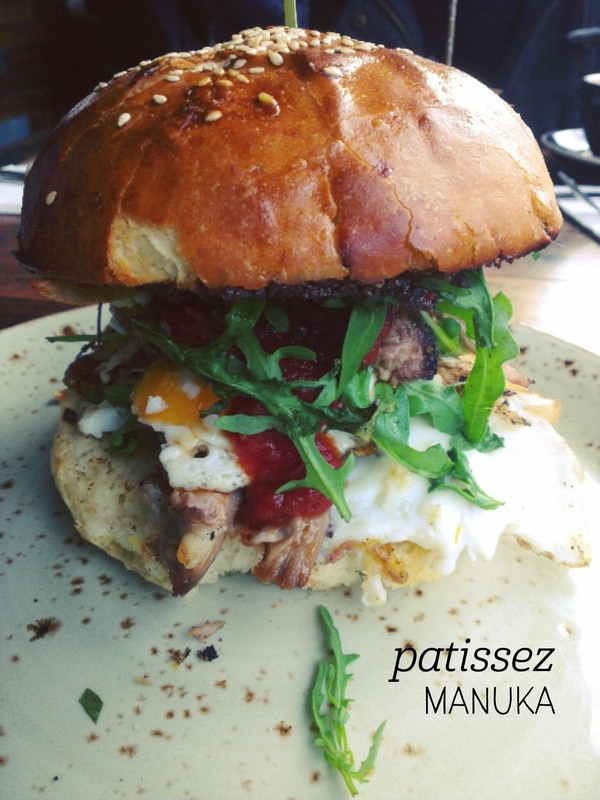 The overall flavours were great – super morish bacon jam, fried egg, fresh rocket and tomato sauce – but the pulled pork itself was a little disappointing (it didn’t have a lot of flavour). Unfortunately my meal arrived long before the rest, and my friend who got her meal last then had to wait another 5 minutes for a spoon to be able to eat said meal, which dampened the otherwise warm and friendly service experience. With a few tweaks this could be an excellent breakfast destination. Part one is here. Finally the main game – the peri peri 1/2 chicken. Oh my. Next time I’d skip the entree and just have this baby. Hello spice, hello flavour! 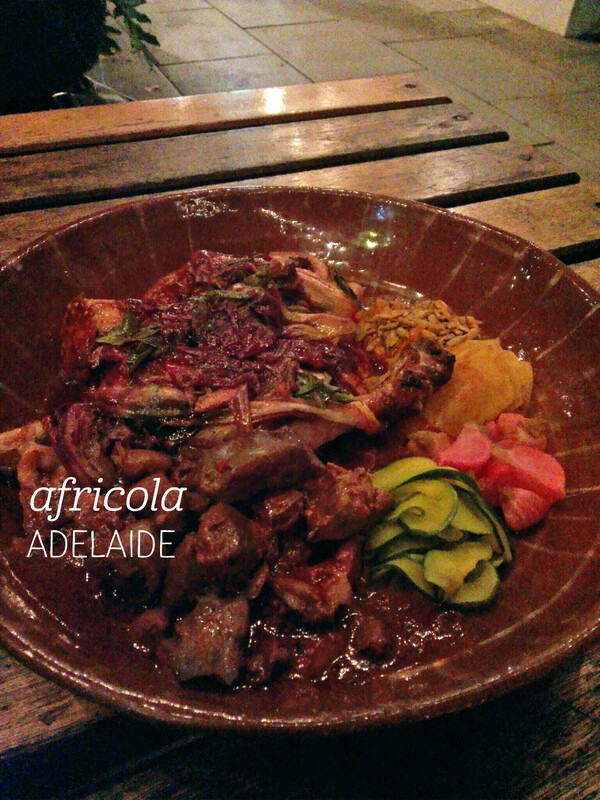 The chicken was perfectly cooked and the (boom) chakalaka spicy leaves on top were so tasty. I loved the little pickled root vegetables and the crunch from the toasted pepitas. The chicken livers and hearts were deliciously rich and there was a fabulously spicy sauce coating the whole lot. A pot of polenta-like something came out with a lovely tomato sauce through it, which meant there was no way we were leaving hungry. We’d also ordered a plate of the yoghurt-baked carrots (also served with goat’s curd) and these were to die for. They were perfectly roasted and the flavours were so well-balanced! They also helped to cool down the spice from the chicken. Whilst the entrees felt ‘chefy’, the main was exactly what you would imagine South African food to be – hearty, jam-packed full of flavour and perfect for sharing. The wait staff were amazing, getting us fed in the one hour we had and regularly checking on the gas heaters and refilling our water. I’ll book for inside next time, because the vibe was amazing, but I’m glad I got to experience that chicken. I will be back for sure. 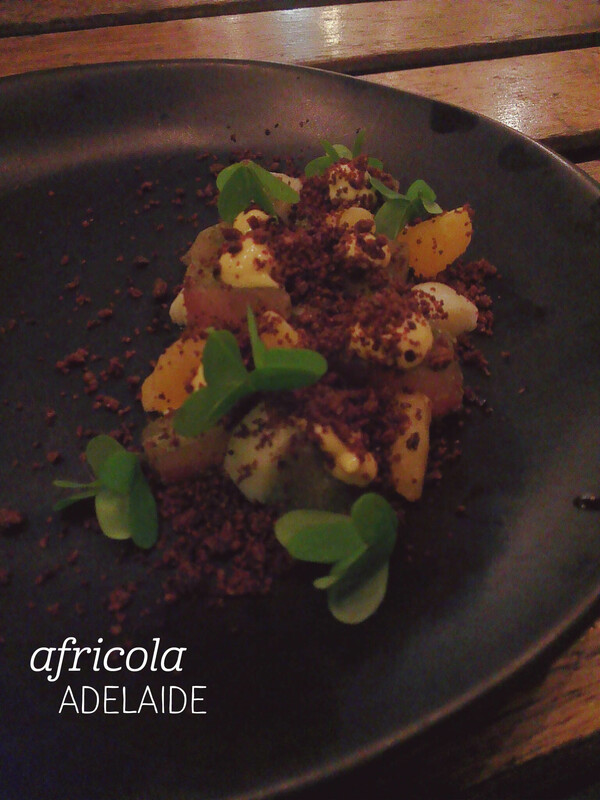 I finally made it to Africola! I was super excited to try South African food for the first time! We booked on a Friday night and were allocated outdoor seating, but we certainly weren’t neglected despite seating in front of Botanic Bar. I started with the Bluna cocktail – gin, orange wine, gooseberry and Rooibos cola combined into a light and lolly-sweet mix (yum!). Meals come with a complimentary serve of house-made flatbread and smoky goat’s curd – a perfect way to whet the appetite. Dish one was the charcoal marron served with a seaweed dressing. The marron was tender and soft and I mopped up all of the seaweed dressing – it was like the best nori in oil with a great salty hit. This dish was a real winner for flavour, but when they say entree size, they mean it. Entree two was the raw kingfish with mandarin segments, mandarin gel and goat’s curd. 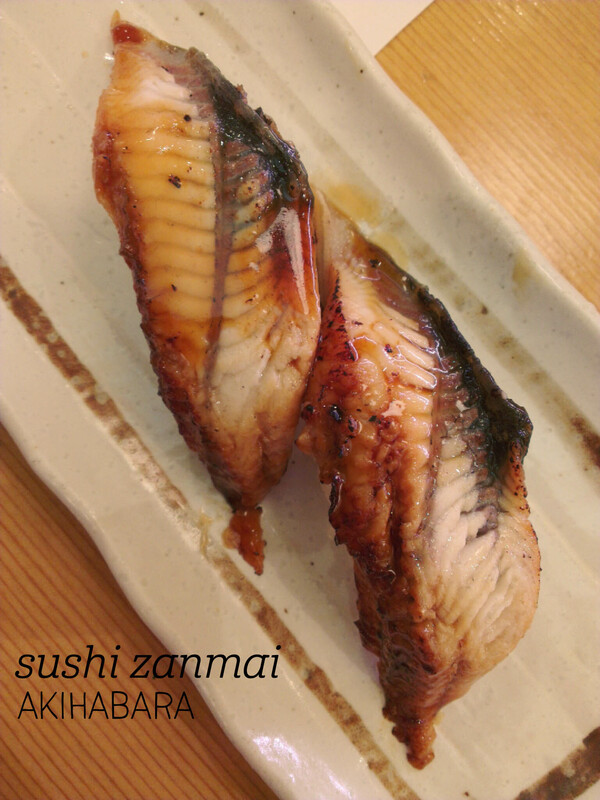 For me, the kingfish was the only thing that didn’t work – when I order fish I want to taste it, instead all I got was mandarin with the texture of fish, which was a bit odd. Overall I felt like the entrees were trying a bit too hard to be ‘chefy’. Part two to follow.